I took these screen shots from the Science Museum of Minnesota's Flood Cam. The first shot is just before sunset on Sunday night. The second photo is one of the first from when the sun came up this morning. 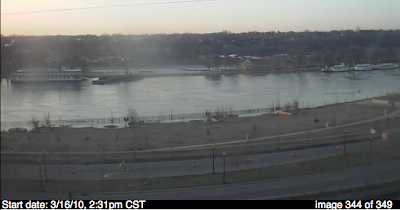 If you look carefully you can see the water has spilled over onto Harriet Island. You can also see the Paddleford boat. They have pulled a barge in front of it so that it won't be damaged by flood debris coming down the river. Birdchick has on location photos of the river over at her blog.